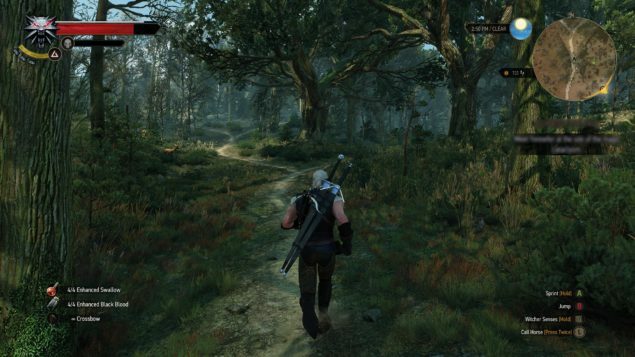 CD Projekt Red’s new addition to the Witcher series, The Witcher 3: Wild Hunt looks one of the most graphically amazing games of 2015. 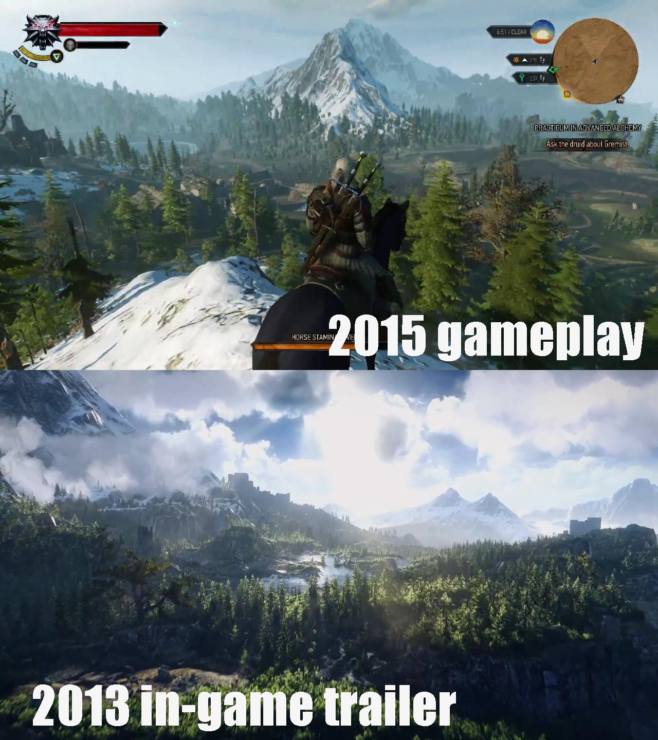 The visuals really step it up in the gaming world but sadly now as the release gets closer, the game has been downgraded from what was initially the texture quality. 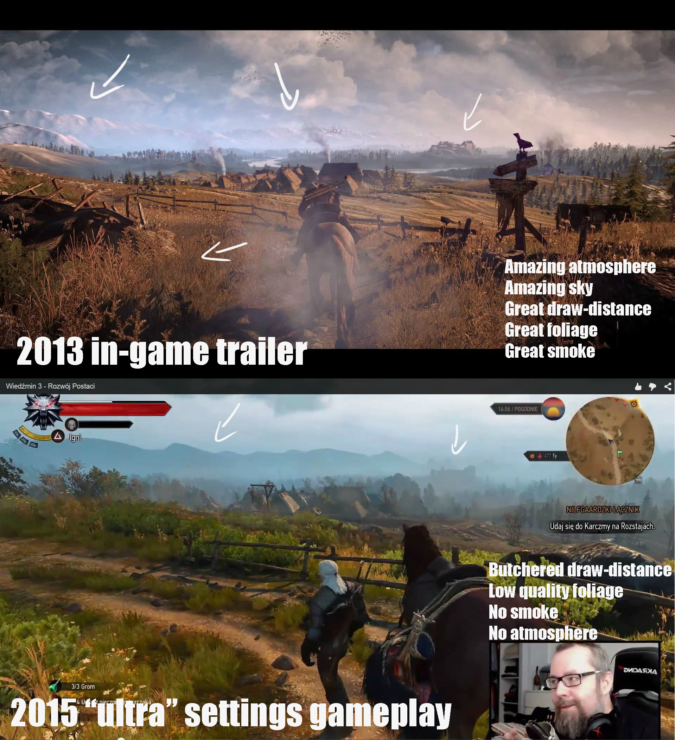 Make no mistake, The Witcher 3 is still one of the most picture perfect games I’ve seen but a comparison shows that the game is no longer its former self when its gameplay trailer was revealed back in 2013. 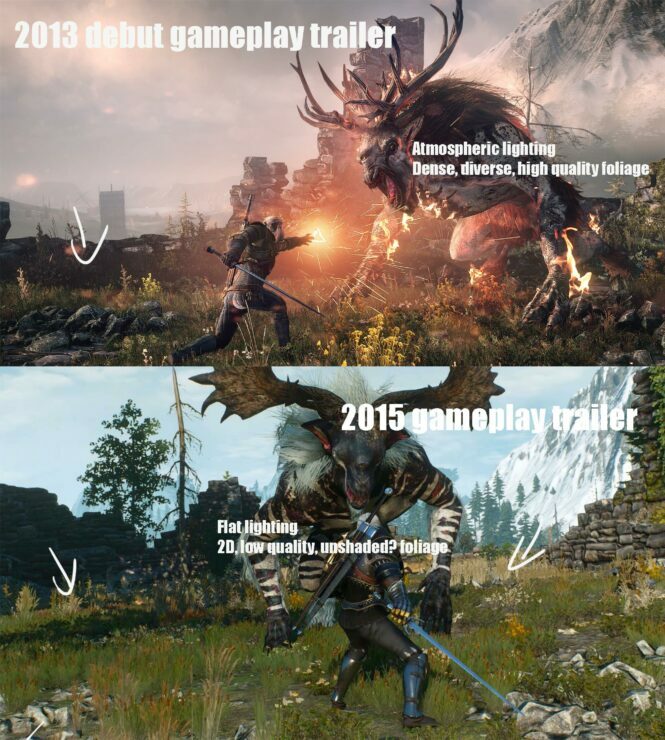 The specific word that fits here is ‘ Downgraded’ and trust me, I’m not happy about it either but it is a choice CD Projekt Red made to make the game available to a much larger user base. 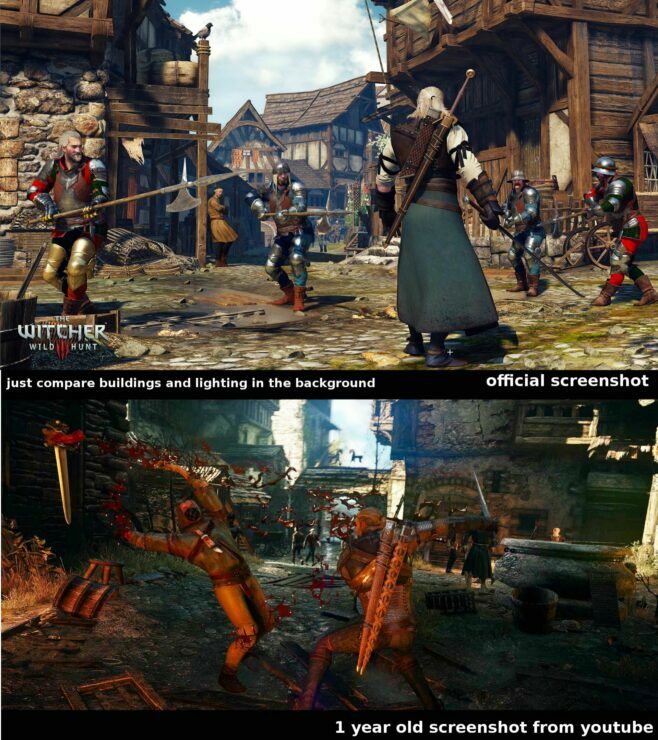 To show how The Witcher 3: Wild Hunt has changed over the course of its development, CD Projekt Red has been quite open to discussions and we have screenshots to witness the changed game overtime. Provided by Guru3D’s member “(.)(. )“, this comparison details the differences between the two builds where the amount of particle on the screen has dramatically been reduced. The environmental level of detail has sufered immensely and the lightening system seems much weaker than the one featuring in the oldest build of the Witcher 3. Check out these comparison screenshots below to see the major changes in detail yourself. Well, that makes it quite obvious that the original game will not be as good as the game the developers would’ve liked to showcase in their list of achievements. 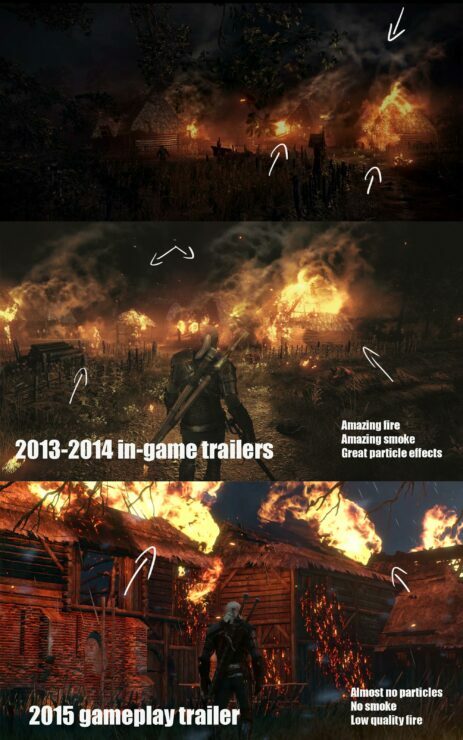 But it’s also quite clear that such a downgrade is not because of the developers but it was one for the fans. 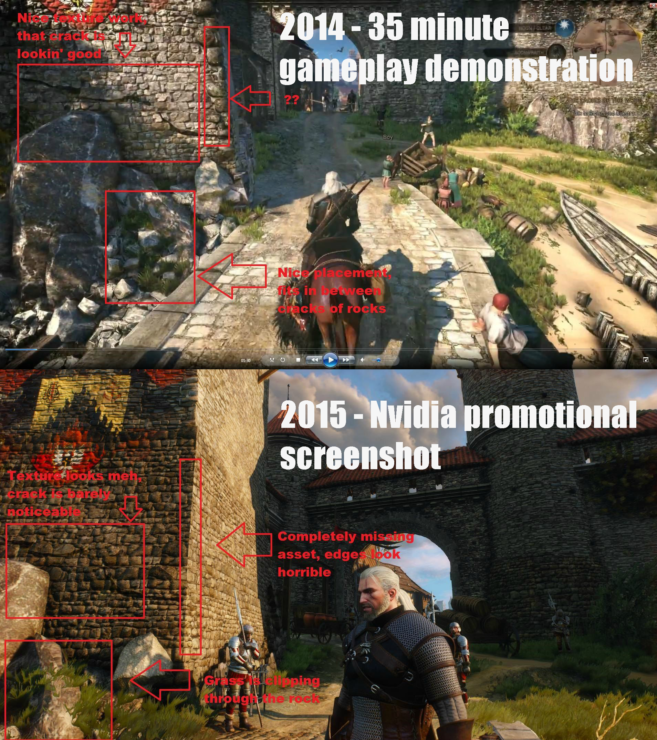 Such a graphically intense game would require an immensely overpowered PC with a top of the line video card. The current level of hardware we have on the latest Xbox One and PS4 consoles wouldn’t have been able to run the game on such graphics so this downgrade is a result of the developers having to give up their end to satisfy the consumer demands. Nevertheless, we’ve had many screenshots, gameplays and other releases on the game which have more than satisfied our appetite for the amazing Witcher 3 game that is to release in just over a week. We’ll keep you up to date with the latest on the game and until then, do share your views with us in the comments section.